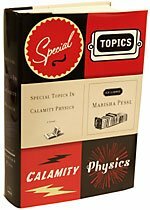 Marisha Pessl's debut novel, Special Topics in Calamity Physics, has been getting rave reviews. Laura Miller called it "a real novel, one of substance and breadth, with an arresting story and that rarest of delights, a great ending." Liesl Schillinger said "this skylarking book will leave readers salivating for more." The bottom line from Janet Maslin's New York Times review: "Q: Is Special Topics in Calamity Physics required reading for devotees of inventive new fiction? A: Yes." Pessl can write a rave, too. The verve with which she described some books for The Week not only whet my anticipation for her novel but made me want to read these books she loves. In these tales, which range from a screenwriter in a psychiatric ward to weary grifters wandering the American West, D’Ambrosio displays a talent and versatility of language that is jaw-dropping. I’m crossing my fingers he’s working on an 800-page novel so I can spend weeks with his work, rather than a cherished afternoon. Biblical in scale but nimble in execution. Not since Toni Morrison’s Beloved hav e stories about the effects of slavery been so heartbreaking, or powerfully rendered. Jones’ prose is deceitfully plain, pitch-perfect, fascinating. I’m awaiting his upcoming book of stories, All Aunt Hagar’s Children. 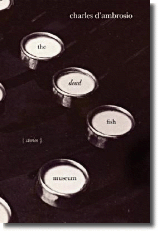 Click here to read about the other four books on Pessl's list. The Known World won the Pulitzer Prize and earned excellent reviews. Click here to read an interview with Edward P. Jones, and here to read an excerpt from the novel. D'Ambrosio's short story collection enjoyed wide praise; click here to read an excerpt from one of the stories, "The High Divide."